Hello there, as promised this post is about the products/startups inspired by climate and green technology domains. I have shortlisted these products based on their innovation. I hope you like them as well. Please note that this is not a promotional post. The company was founded in 2014 by Romain Lacombe and David Lissmyr. They raised $4.5M in seed funding. It was selected as part of StartX, the startup accelerator program at Stanford University. The company provides two products: Flow and Air Report. Flow tracks and measures real-time concentrations of NO2, VOC (Volatile Organic Compound), PM2.5 and PM10. Flow maps air pollution variations around you in real time, so you can find the location having clean air. It is available for preorder in July 2018 for $139. The Plume Air Report reveals pollution peaks and fresh air moments throughout the day via their app. As per their press release, by adding new data feeds from satellite and atmospheric models (I will discuss climate models in upcoming posts) to its air quality forecasting platform, the company made its app coverage jump from 430 cities to hundreds of thousands worldwide. Users can now know real-time estimates of what they breathe in every city in the world—even small towns without official air quality monitoring stations. The free mobile app Plume Air Report uses advanced machine learning and data fusion from a variety of sources—initially from 12,000 government-operated monitoring stations, and now from a variety of satellite, atmospheric models and weather data, to give live and forecast air pollution levels, as well as advice on how to find clean air. From active parents to urban athletes and commuters, 73% of Air Report users say it has helped them make changes in their daily routine to avoid smog spikes in their city. Real solid work by the folks at plume LABS! Wakati claims to be the world’s first standalone green technology solution for the preservation of fruits and vegetables without the use of cooling. See “without the use of cooling” is the key phrase here. As there have been pieces of evidence that earlier civilizations did use earthen pots to preserve food items, one such example is pot-in-pot refrigerator which was used by the Indus Valley civilization in 3000 BC and the Egyptians in 2500 BC. Wakati is an alternative technology that increases the shelf life of fruits and vegetables for smallholder farmers in developing countries. Wakati creates a sterilized microclimate that dramatically increases the shelf life of these crops. A sterilized gas that is not harmful and FDA (Food and Drug Administration USA) approved. This gas reduces the ethylene that has an effect on slowing down the ripening process and also fights fungi. Now, the unique thing about Wakati is that with only one litre of water a week, it enables you to store up to 200 kgs of fruits and vegetables. It is powered by a small solar panel, no extra care is needed. Awesome! Oxidising storage, the ripening hormone of fruits and vegetables by ozone. Pop-up style tent, made of airtight fabric, contains the microclimate during the storage. A solar panel of 10 watts creates the high humidity atmosphere by ultrasonic evaporation and an electric corona discharge creates ozone. No additional chemicals are needed, just add water. As of June 2017, Wakati is turning into an open-source project. It has already been tested in various parts of Africa. Wakati has a lifecycle of 2 years. Wakati’s sales prices will vary from country to country but is estimated around $100. However, they are planning to scale up their production and lower the selling price by 30%. We truly need innovations like these for the farmers around the World! Founded in 2016, Brizi is a London-based startup focused on developing a new, high-function active fan filter supported by a digital app that is designed to protect children from air pollution in an urban environment. Brizi’s specially designed hi-tech sensor detects harmful gases and particulates in the air. It uploads this information to the Brizi App via Bluetooth. The sensor is capable of delivering 10 readings per second and is configured to detect carbon monoxide and nitrogen dioxide. It includes a PM2.5 sensor for particulate matter. The fan in the cushion filters pollution out of the air in the baby’s breathing area using Brizi’s specially designed filters. These are high-grade medical-quality filters similar to the filters used in hospital incubators. A carbon layer helps filter gases, while a nanometric, woven-fabric layer intercepts particulates. Brizi’s fan delivers 1.5 litres of clean, filtered air to the child’s breathing area every ten seconds. This helps create a clean air barrier in the child’s breathing area, both delivering clean air and preventing polluted air from entering the breathing zone. The app is also community driven. As more people use the Brizi’s app, the data from the app will show you which walking routes are more polluted than others so you know the cleanest routes for you and your baby. Another project working towards addressing the issue of climate change, in this case helping our planet’s saviour the mighty oceans. It is due to the oceans that our planet does not respond to climate change so quickly. Thanks to their very large specific heat capacity (about 1000x larger than the heat capacity of the Earth’s atmosphere) the oceans act as a thermostat to control Earth’s climate. The Oceaneos Marine Research Foundation is a non-profit research organization based in Vancouver (BC), Canada developing technology to address the critical problem of the global fishery and marine ecosystem collapse as a result of climate change. Oceaneos engages in the scientific research and development of Ocean Seeding: a method that rehabilitates marine ecosystems and increases wild fish populations at a local scale through ocean fertilization. Current projections suggest that by 2050 oceans will be depleted and the fishery industry will cease to exist. This is already a major disaster for billions of people that are directly dependent on the oceans and fish as their main source of protein and income. Oceaneos implements Ocean Seeding projects in close collaboration with governments, fishery industry, and universities. Ocean fertilization is the natural process by which iron particles reach the sunlit upper layers of the ocean and enhance primary productivity. This can happen due to upwelling currents at the western seaboard of continents, iceberg melting, seasonal glacier runoff, riverine input, iron-rich dust in winds, and volcanic eruptions that deposit iron over the ocean surface. More specifically, ocean iron fertilization (OIF), is the artificial mimicry of ocean fertilization. OIF adds iron to nutrient-limited areas of the ocean, and it has been implemented in the past to study the flow of carbon in the marine ecosystem, testing ideas related to carbon dioxide removal from the atmosphere to mitigate climate change. Therefore, OIF has a been historically linked to geoengineering. 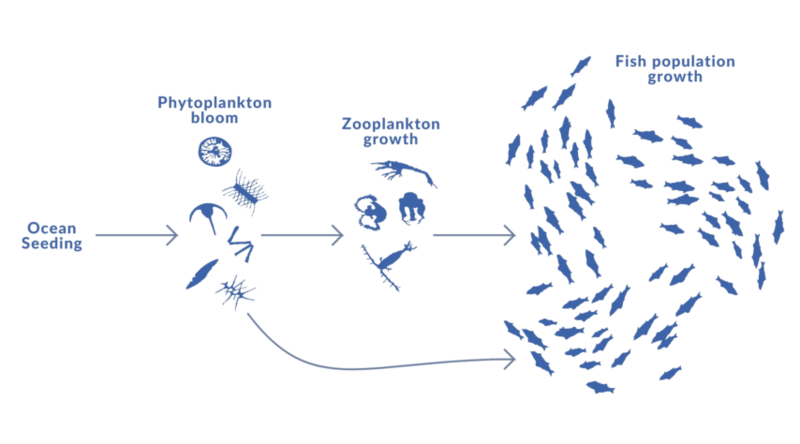 In contrast, Ocean Seeding is the application of iron for the purpose of enhancing primary productivity and the trophic cascade that depends on the phytoplankton bloom, specifically diatoms, for energy and nutrients. Ocean Seeding tests hypotheses related to marine ecology and trophic dynamics, in order to build a better understanding of energy pathways in the marine food web. Under this research focus, Ocean Seeding is not geoengineering. So we saw how there are startups emerging in the climate domain with some amazing innovative products/services. If you know any other cool startup(s), do let me know in the comments. In the upcoming post, I will talk about the recent buzzword Blockchain in the context of the energy sector. Keep following TLP! Disclaimer: In this post, some of the technical text is same as their original source(s) to maintain the clarity. Please contact me if you need any clarifications/changes.